Recently I was traveling and when I finally got to my home airport – Bradley International – I was waiting for my bag at baggage claim. For some reason, my bag is always dead last when coming through baggage claim, which is kind of annoying, but it also gives me some time to relax and watch how worked up people get while waiting for their luggage. Basically what happens is that everyone kind of just hangs out and waits around, and everything seems cool. Then, the second the baggage “belt” starts going its almost like the tension goes up 10 fold. You can immediately see everyone (especially the old people) get in stance…like as if their rolling suitcase, which is coming at them at the speed of 10 feet per minute is going to wiz by without warning and not come by again! Ha, there’s also the people that check each and every bag to make sure its not theirs, like they forgot what bag they stuffed their clothes in 4 hours ago, or the “flippers” that turn every suitcase over, you know, to “help”, when really they are just in everyone’s way. And then…well then there’s something that even I haven’t seen before, and I’ve seen some pretty ridiculous things. This woman pulls something off the baggage belt that from afar looks like a brand new comforter in it’s packaging. If that’s what it really was, that would be one thing, but no. 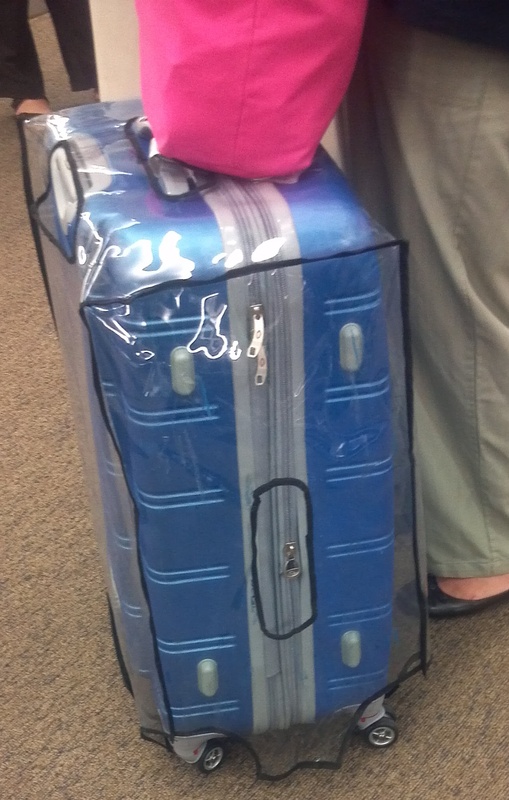 This woman, legitimately has a thick plastic cover on her beloved rolling bag. Are ya kiddin me!? This is by far one of the tackiest things I’ve ever witnessed in the flesh. Guarantee this woman has plastic covers on her couches and a travel-sized purelle attached to her key-chain. Honestly, there are some things that people should just be embarrassed about, and this…well this is one of them.